With the pick-up in the housing market, house hunters, real estate professionals, and nosy neighbors should check out the Zillow iPhone, iPod Touch, and iPad app. It is filled with simple and surprising tools to help you search for homes for sale, rent, pre-market, and foreclosure. 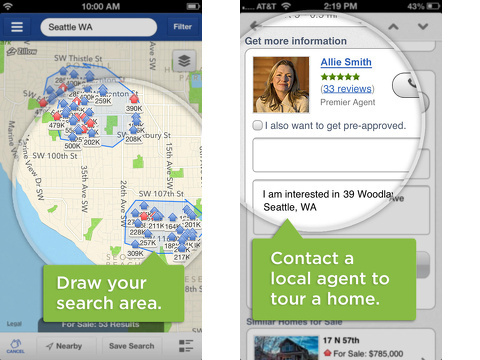 The Zillow iPhone app uses a sliding left menu to help you access navigation tools like the Facebook iPhone app. You can move between properties for sale and pre-market, for rent, or all homes. You can also calculate mortgages and compare mortgage rates. You can check out your favorites and saved searches after you have created or authorized your account. You can create an account with your email and password, or you can use a Facebook authorization that does not post to your timeline. The interface for a house search is surprisingly streamlined and well-organized. The top menu bar accommodates a manual entry of a location, so you can enter a zip code, street name, or city. You may filter options by touching the appropriate icon in the upper right hand corner. A new form slides on the screen from the right. You can turn on and off filters for properties for sale, pre-market, and recent sales. Then, for each type of property-for sale, pre-market, and recently sold- you can filter parameters further by tapping the down arrow next to each item on the list. More options pop-up on the screen, so you can choose by agent, by owner, new home, foreclosure, exclude pending, price change only, and open house only with the for sale properties. You just tap the check mark to include or not include. The pre-market homes allow you to select homes that have been foreclosed, in pre-foreclosure, or make me move. The make me move option is interesting, as owners can list their house on Zillow without listing formally on MLS. You can also select bedroom number, bath, type of home, square feet, lot size, year built, days on zillow, and a keyword search. The number of filters helps you narrow the search with simple, intuitive interface. The map view shows the homes for sale with an approximate price and a colorful house graphic. As you pinch and zoom, you can actually see the houses for sale and the approximate value of all neighboring properties as calculated by Zillow-a figure known as a Zestimate. You can tap a property for sale, and a pop-up gives you details like price, address, bedrooms, baths, square footage, and any price changes with date of change. With a second tap, you open up detailed information. You scroll with horizontal swipes through the thumbnail images in the top of the screen. The property description, additional features, and helpful info like the last date of sale and the price are included in a concise, yet thorough form. You can tap the save icon to add to your favorites. 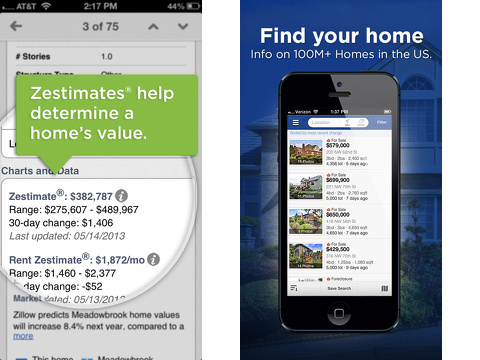 Additional cool tools are included with the Zillow iPhone app. You can add notes to a property you save. You can also get great mortgage information. From the sliding left menu, you select the mortgage options. The daily average of a 30 year fixed loan is available in a graph. You can also select the option to get custom rates. A form that allows you to plug in your property zip code, purchase price, down payment, credit score, annual income, and monthly debts to get custom rates from within the Zillow iPhone app. The map view is definitely my preferred viewing format, but you can also switch to list view with a touch. The Zillow iPhone, iPod Touch, and iPad app blows most MLS mobile websites out of the park with its wealth of information and easy navigation. AppSafari review of Real Estate by Zillow – Homes & Apartments, For Sale or Rent was written by Jenni Ward on September 17th, 2013 and categorized under App Store, Finance, Free, Homes, iPad apps, Reference, Universal. Page viewed 5581 times, 3 so far today. Need help on using these apps? Please read the Help Page. Nice app for real estate makes our life easier.